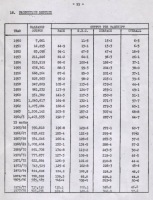 1937 : An announcement is made by B.A. 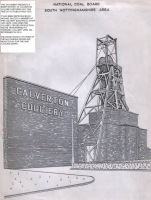 Collieries that it plans to have a coal mine at Calverton. They say the proposed mine should yield 100 million tonnes of coal. They also point out that men will be employed for over "125 years". 1947 : All U.K Collieries are nationalised and will now be run by the National Coal Board. Boring began on January 1, 1947. Freezing operations began - because some of the surface equipment could not be ready in time - on August 28, 1948. 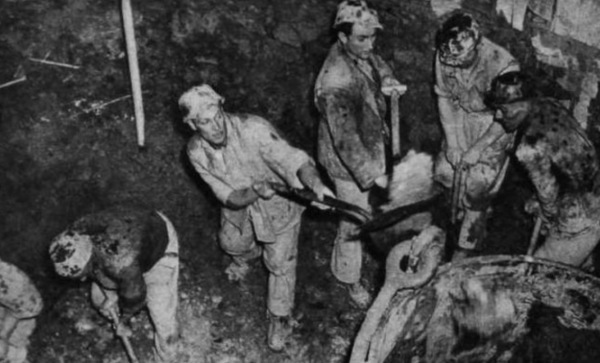 Sinking the holes for the freezer pipes started November 23, 1948, and by May 11, 1949, the twenty-five freezing holes had been sunk around a 33-feet diameter circle to the bottom of the watery strata 412 feet from the surface. When the new headgear was finished late in 1948 it was believed to be the tallest in the country - 145 feet from ground to the top of the "Cat's Gallows." There was no hitch - and thawing out was finished by July 1949. But the below-zero temperatures in which the men worked are really part of the human drama enacted throughout the Calverton shaft sinking. At 100 feet down it was found, as work proceeded through the ice collar, that the air temperature was 22 degrees Fahrenheit, the temperature of the walls 18 degrees Fahrenheit. Ten to fourteen degrees below freezing point - wonderful for the purpose, but tough on men cutting a painful way through the ice-hard rock. The compressed air drills froze every twenty minutes - and had to be thawed out. The concrete would not set well on the frozen walls. So from freezing, by refrigeration experts, to heating by electrical engineers. Three heaters were rigged on a frame which could be raised or lowered in the shaft. They gave an even flow of warm air - enough to prevent the tools freezing, enough to let concrete set, enough to raise the temperature to six degrees above freezing point. (B) First 60ft. below the surface before bunter sandstone is encountered. (C) Water - bearing bunter sandstone bed. 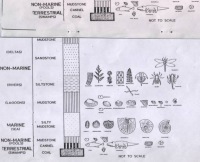 (D) Marl (clay bed 300ft. thick, which separates porous sandstone from coal measures and rock). The high main coal seam is 1,100ft. below surface. Continuation of shaft, marked with arrow, would proceed normally in a month's time. The collar of ice, estimated to be 70ft. in diameter, was formed by ringing the shaft with cooled brine from a surface plant. 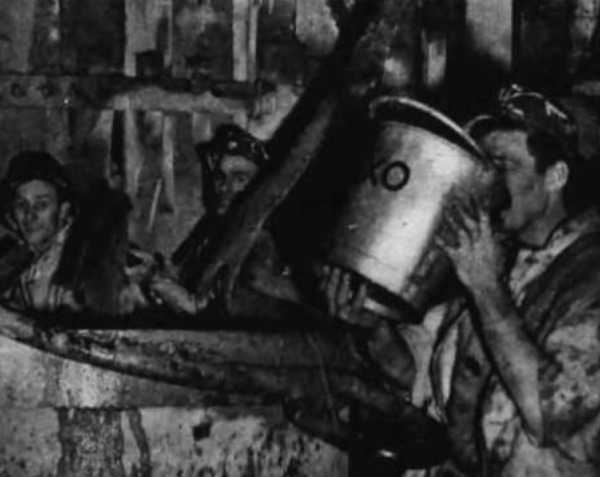 Duffle-coated, way down in the shaft, Marshall, Chantry and Joe Webster, swing the full "hoppit"
The "hoppit," emptied of men is filled with wet muck - by Jack Atherley and Arthur Chamberlain - while Colin Marshall snatches a drink of water. Five men, shaft-sinking crew, in a "hoppit." 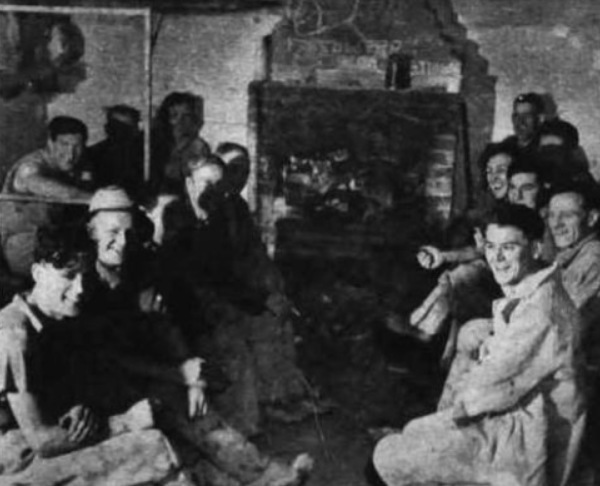 Left to right, Bill Chambers, Joe Chantry, Arthur Miller, "Pom" Leverton, Arthur Chamberlain and, top right in the shaft, "Taff" Lawson. This slight warming up was for the benefit of the tools - not the men. When pumping was used to cope with the tremendous problem of water in the first shaft-sinking, conditions were so bad that 150 men of the sinkers' teams left the job and had to be replaced in the first critical three months. This time the teams were free of water - but they were working in Arctic conditions quite foreign to this kind of job in Britain. "If you slackened off, you froze!" said Cyril Wesson, master sinker, when recalling his stage of the task at Calverton. The men were supplied with two-inch thick felt socks for their oversize boots, with heavy gloves and thick flannel coats. String-type vests, which had proved their worth - and warmth - in the cold zones of the Second World War, were another part of the sinkers' equipment as they fought their own battle with icy rock and icy cold at Calverton. Hot drinks every two hours - and back to the surface for "snap" half-way through their seven-and-a-half-hour shifts. 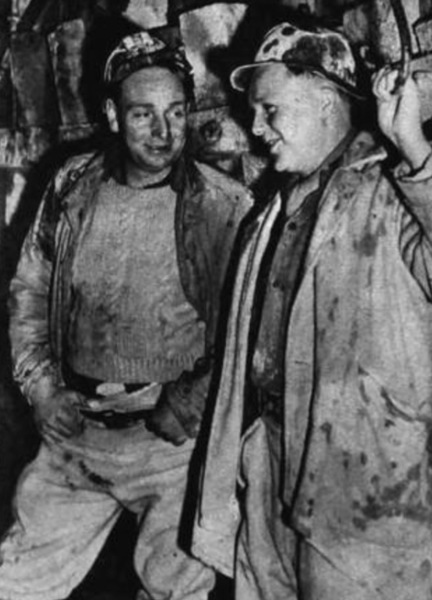 On the job - master sinker Cyril Wesson (left) and one of the chargemen (and pump-rider) Arthur Miller. 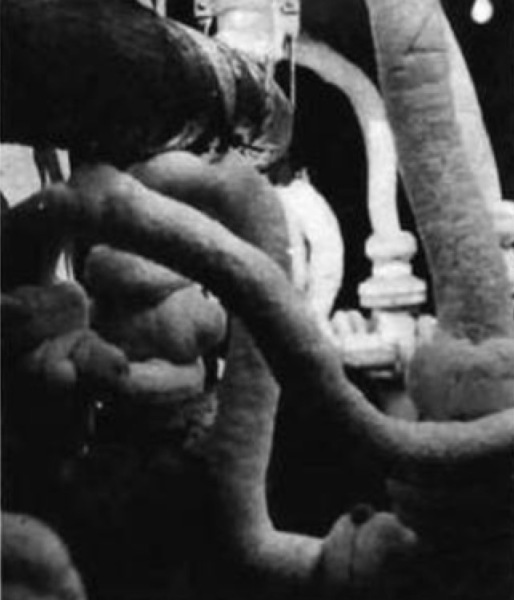 It was really a freezing job - as these ice-coated refrigeration pipes at the shaft end show. Around the fire in the crew's "glory hole," smiling over a shift ended - and a job well done in spite of Arctic cold and ice-hard rock. Twenty-four hours a day in three shifts each of twelve men. Experienced and free hands both learning from hour to hour, day-to-day experience. "The best people I ever worked with; enthusiastic and interested," was No. 6 Area's sinking and boring engineer Arthur Wadsworth's tribute to his teams. "No preconceived ideas on how to do the job, so they came into it with open minds and a fine spirit." At this point, if you went down the shaft in a "hoppit" - a great big, three-ton bucket which took men from the surface to pit bottom, or coal from the onset to the banksman - you could travel in seconds past the hard work of months. You could admire the shaded beauty of the fan-drift as its unscreened vents tumbled light over the rounded edge of the big hole. A lot of the technical detail was hidden behind the cast-iron and concrete lining of the shaft. But it was there - ready for the new winding gear which was hoped to bring 1,000,000 tons to the surface. At 105 feet you would enter the arctic section. At 392 feet you left it behind. At 900 feet you would have reached the point at which the sinkers were working. They had already cut through one three-inch seam of coal. 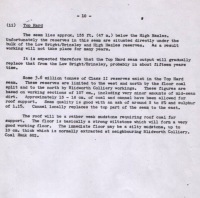 But their first target in the development scheme was the High Main, a 3 feet 3 inch seam, some 1,000 feet down. Below that was Main Bright, High Hazel, Low Hazel and Top Hard, at nearly 1,750 feet. Those five seams - with even more below - are said to be good for a century of work....100,000,000 tonnes! The skip bottom was first to be cast in the High Main level - where development work will be concentrated for twenty-five years. 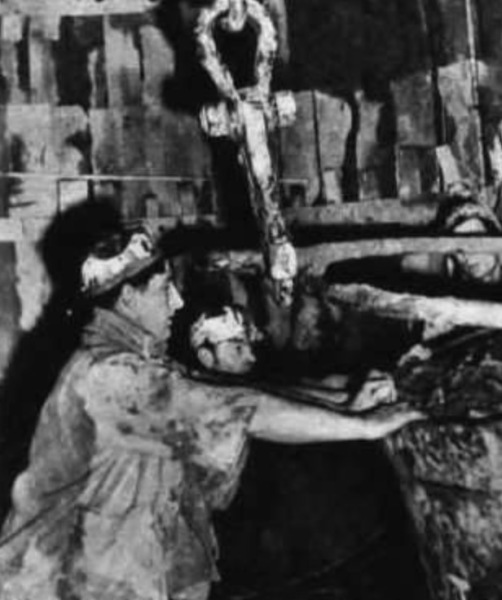 "Mucking out" at the shaft floor - more of the crew : Left to right, Lawson, Bert Holehouse, Eddie Gilfilian, Chantry and Chambers, fill the ever-hungry "hoppit". 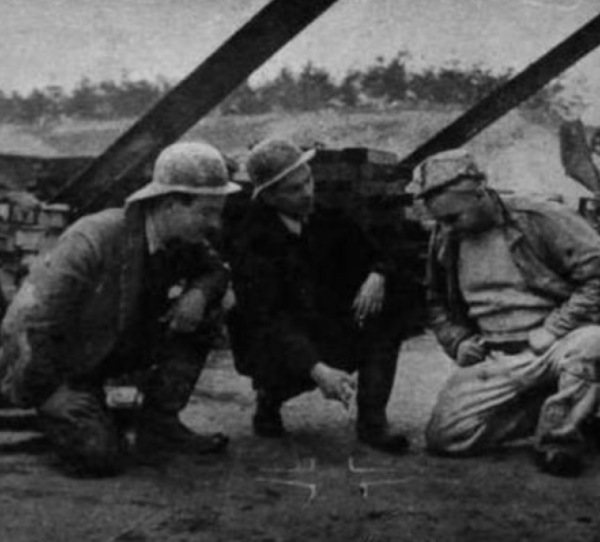 A problem solved by, "Toby" Taylor (assistant sinking and boring engineer), Arthur Wadsworth, and Cyril Wesson, master sinker. Work will then commence on the skip bottom at Low Hazel, and semi-horizon working would then enable coals from Main Bright and High Hazel to be brought out at that level. 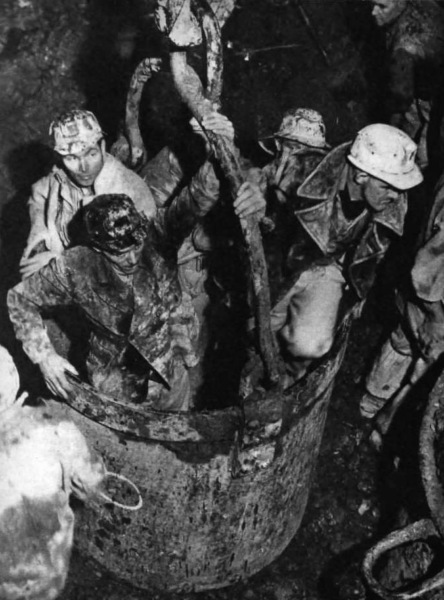 Overall Output Per Man-Shift of 44 Hundredweight, was hoped to be obtained by a projected, 1,770 men underground and 340 surface men. This was against a backdrop of unspoilt countryside, for coal from the 400-ton surge bunker - to be taken there by belt-convenors from the skip winding plant which will be totally enclosed - then travel again via enclosed conveyors under rural Oxton Road over to the coal preparation plant which will be only 600 yards. This mine would be no eyesore amid the lovely scenery of the village. There was to be no dirt tip, for an aerial ropeway was to take the dirt to a re-entrant valley, well away from the preparation plant - with room enough for over thirty years' tipping to be hid. Afterwards the dirt would be graded to merge into the smooth contours of the countryside, and planted with trees. The newly designed colliery sidings could take 1,000 full wagons and 770 'empties'. Diesel locos are to be used. They would be in shortwave radio communication with the full-weigh office. Pressing a switch on a table Lord Leathers set the plant in motion, and declared open both the new colliery and the new railway. At a lunch following the formal opening, Colonel Lancaster, chairman of the B. and A. Collieries Ltd., stated that he had seen the "most modern and technically advanced pit in Europe." Area general manager A. Hill shows Calverton winding-engine house to Lord Leathers. Behind stands N.C.B. 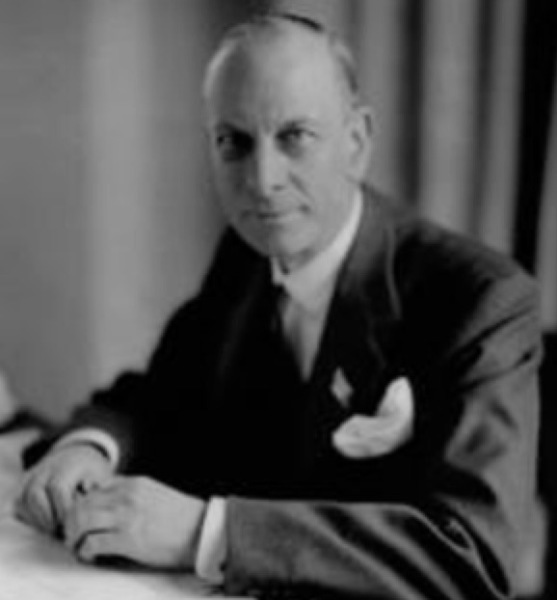 chairman Sir Hubert Houldsworth. Lord Leathers the Secretary of State for Fuel and Power.